The other reason is something more personal. All of us have dreams and I am not embarrassed to say that I had the idea of opening an all day brunch restaurant, before Hatched and Wild Honey existed. Naturally, I felt gutted when both of them entered the Singapore food scene. 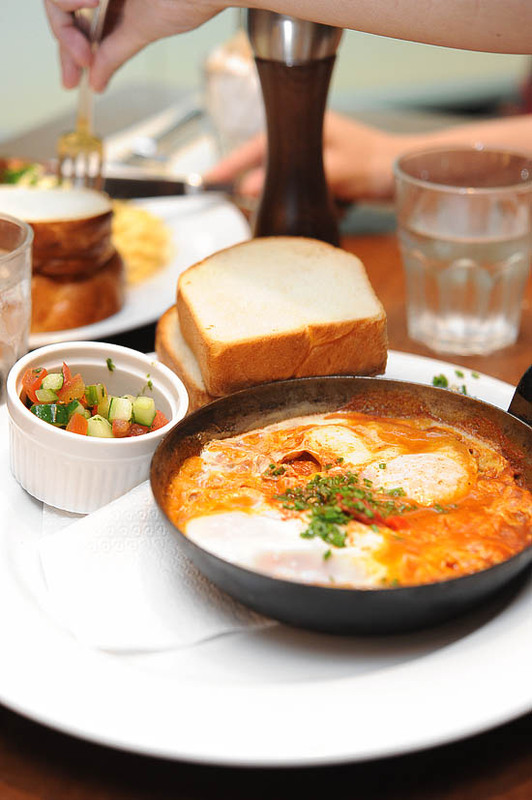 But that’s besides the point, I’m actually happy to see the breakfast trend picking up in Singapore and I strongly feel that there should be more breakfast places opening up to give us more options. I almost shouted that when the waitress brought the English Breakfast ($22) to our table. I wanted everyone to evacuate the restaurant so that I could have the whole plate to myself. You may snigger, you may sneer but take a look at the photo of Wild Honey’s English Breakfast above. This, my dear, is the dream breakfast. What more can a guy ask for when there’s scrambled eggs, sauteed mushrooms, streaky bacon, porky sausages, baked beans and grilled tomato? Even though I have been saying this quite regularly of late, I’d marry anyone who make this breakfast for me. With a glass of icy cold milk, or a cup of warm and aromatic coffee, the English Breakfast can really make me believe in Walt Disney for once — happy endings do exist. It burns. It burns so good. Physical pain never feel so good – it makes me feel alive. Stewed to a color of vibrant red, the Tunisian breakfast ($18) was an excellent choice. I didn’t take caution to the scalding-hot tomato stew at all. All I saw was two delicious fried eggs crowned on top of the red, and peppery tomato stew that was accompanied by sliced chorizo sausage. It was such an indulgence to dig the delicious bread (soft and fluffy) into the tomato stew. If this is breakfast, I do not want to have lunch and dinner anymore. The Mediterranean sandwich ($12) paled in comparison with the other breakfast items. I have totally nothing against sandwiches. But to me, it’s merely two halves of bread slapped together (in this case, toasted ciabatta) with some fillings in between. 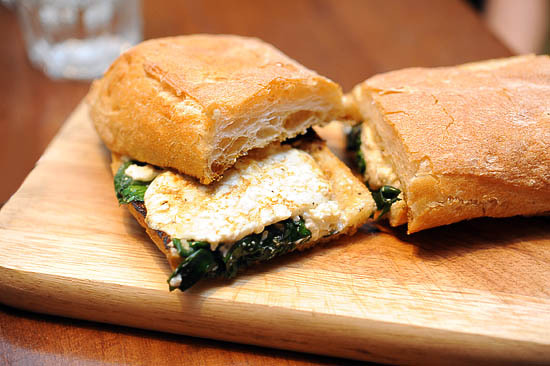 Maybe it’s just me, but wilted spinach with feta and mozzarella cheese didn’t appeal to me when there’s sausages, pancakes or eggs to choose from. 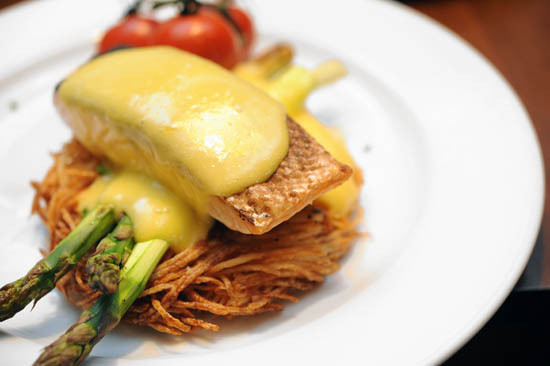 Drizzled with the bright hollandaise sauce, the salmon was served on a bed of potato rosti and asparagus. I liked how the salmon broke off when it came into contact with the spoon. While it didn’t come close to the melt-in-the-mouth effect, the rich and creamy hollandaise sauce complimented the sweet salmon of the Scandinavian breakfast ($24) perfectly. There are complains about the service at Wild Honey and I can understand why. It seems a little ridiculous to pay for the 10% service charge when we have to queue up at the counter to order our food. From what I understand, they do not allow reservations as they are quite packed during peak hours. So if you want to enjoy a Sunday brunch, please go during odd hours to avoid the crowd during lunch and dinner. Otherwise, I’d think that Wild Honey is a lovely place since there aren’t that many restaurants serving all day brunch in Orchard. For a restaurant that is located in a shopping mall, Wild Honey stands out with its cozy and intimate ambiance. The breakfast food is not cheap, most of the items on the breakfast menu are around 20 bucks (before taxes). But given that they allow you the freedom to have breakfast food during odd timings, Wild Honey is one of the Mandarin Gallery Restaurants that I can see myself going back to. Not going to pull me away from Epicurious for weekend brunch or Eggs Benedict… but I must sample the Tunisian breakfast! The Tunisian breakfast is fab! But it is on the expensive side and the ‘no reservations’ thing pisses me off, cos they charge a bomb plus service charge too. Still, I go once in a blue moon to indulge. 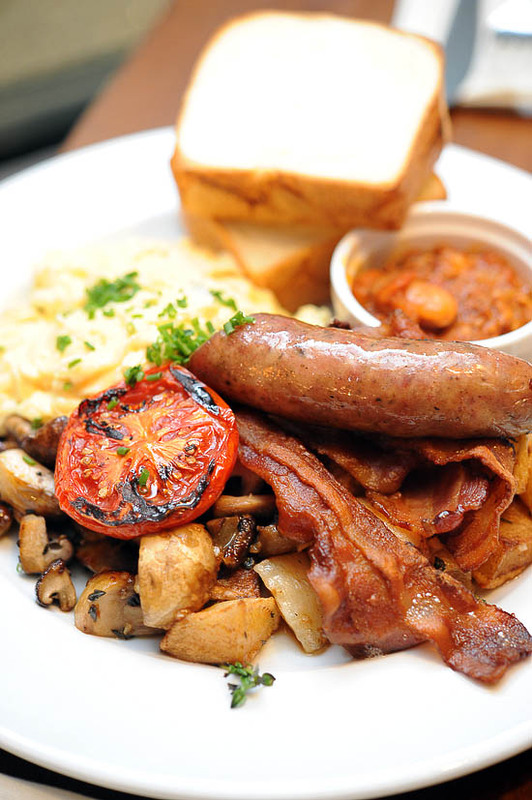 I will keep the English breakfast to myself too, all my favourites on one plate. anyone had the japanese set? looks interesting but hadn’t had the chance to order it. i like. i too will marry anyone who make the english breakfast set for me. Could totally understand what you meant by shouting fire..lol what an appropriate reaction to the english breakfast! And yes I do have the very same reaction, utterly yummy and satisfaction to the max.. The space constraint is probably not doing much justice to its sumptuous brunch..
esther: We shared the same sentiments. once in a blue moon then. let me know when the blue moon is here! tootall: you shall try the Japanese set next and let us know if it’s good! irony: it’s quite funny isn’t it? lol! yea i guess, but wild honey is in Mandarin Gallery, which is a shopping mall after all. Naturally there will be space constraint. Had to wait around 2 hours to sample their “famous” breakfast….approximately $40 for some waffles, but the Tunisian seemed nice. The hostess was so rude, but once seated, the gentleman who seemed like the owner was very nice. But they did seem like they wanted us out after the meal, so this place is not suitable for a leisurely sunday brunch. Still am angry when I think about how rude and impatiend the hostess was. I’m thinking why did I not make reservations, but I don’t think they take it in the first place. Good 2hrs and 20 mins spent in Mandarin Gallery. Were the pictures taken at mandarin gallery’s outlet? How did they come out so white and bright! Isn’t the lighting there quite bad for taking photos since it’s mostly yellow lights? I’m really curious! Just visited yesterday and have to say that though the breakfast is good, the hostess (or should i say Door B*tch) really ruined the whole experience. I wouldn’t eat here again. The pinoy lead staff at the counter in MG branch is rude when asking the table number to the customer before me. Very unlikely to a pinoy in F&B. Don’t expect customer to remember their table number at once, since we are busy choosing what to order, and this is the only high end restaurant that ask customers to fall in line in the counter and yet 10% Service charge is imposed. I wanted to enjoy our night , but this ruined my dinner. Just saying. Food are nice though. Tunisian is great. I am writing as an extremely upset almost-customer. I was from Orchard Then travelled to Outram Park then travelled back to Somerset on the hunt for a breakfast meal for dinner for my boyfriend who was staying at work late. What else tops bacon and eggs for the guy? Nothing much really. I wanted to get him something nice for dinner to maybe brighten his day at least a little as he’s been having to work late these past couple of weeks. So, I travelled from Outram all the way back to Wild Honey at Mandarin Gallery and reached the place at 9:06pm on 25/09/2013. I told the long, dyed-brown haired lady in black at the door I’d like to order takeaway but she said they were closed. I enquired,’I thought you guys closed at 10?’ She replied that for tonight they were closing at 9pm. Disappointed, I went out. However, due to the time, I thought it’d be almost impossible to get to another place that served all-day breakfast at most places close at 9:30pm, so I went in again and told her about how I was trying to get dinner for my boyfriend who was staying late at work and she said,”Oh, we’ve already closed the cash register.” I ended up taking a cab down to The Book Cafe and taking a cab back to Somerset station, then headed to my boyfriend’s work place. And now I’m home and it’s 12am. WOULD IT HAVE BEEN THAT HARD TO OPEN THE CASH REGISTER AGAIN? It was only 6 minutes past the non-usual closing time. No thanks to that lady being nothing more than unhelpful, my time was totally wasted on running around. Horrible, horrible experience at Wild Honey today. Staff just horrible, particularly the register and management. Turned my head and dishes cleared without a word. Their way of saying, please hurry up and vacate the table I waited an hour for. Complained to manager and said I wanted a refund on my service charge (paid in advance and no service given, at least not any more than your standard hawker cente) Was told they couldn’t do it, but was offered vouchers instead. Are you kidding me?!? Aren’t those just coupons meant to get me to pay even more money? Cpl bucks off my next $100 meal? I might give Scott’s road another chance in the future, had good experiences there. But I might never set foot in mandarin Gallry again after this debacle. Worst experience ever in Singapore dining! Wild Honey Scotts branch, TERRIBLE service (charging 10% service charge?) and potatoes were not fresh and breakfast were served cold! Chef insisted that he can’t have the salsa sauce put on the side!!!! Wild Honey gives Singapore a bad reputation on service!! We are not going back!